Mimi Schwartz grew up on milkshakes and hamburgers—and her father’s boyhood stories. She rarely took the stories seriously. What was a modern American teenager supposed to make of these accounts of a village in Germany where, according to her father, “before Hitler, everyone got along”? It was only many years later, when she heard a remarkable story of the Torah from that very village being rescued by Christians on Kristallnacht, that Schwartz began to sense what these stories might really mean. Thus began a twelve-year quest covering three continents as Schwartz sought answers in the historical records and among those who remembered that time. Welcomed into the homes of both the Jews who had fled the village fifty years earlier and the Christians who had remained, Schwartz heard countless stories about life in one small village before, during, and after Nazi times. Sometimes stories overlapped, sometimes one memory challenged another, but always they seemed to muddy the waters of easy judgment. 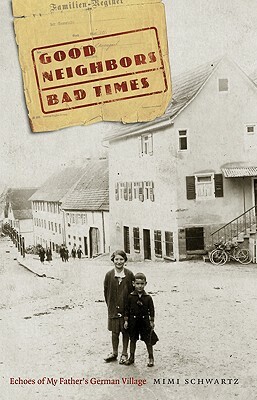 How, this book asks, do neighbors maintain a modicum of decency in such times of political extremism when fear and hatred strain the bonds of loyalty and neighborly compassion? How do we negotiate evil and remain humane when, as in the Nazi years, hate rules? Mimi Schwartz is a professor emerita of writing at Richard Stockton College. She is the author of Thoughts from a Queen-Sized Bed, available in a Bison Books edition, and Writing True, the Art and Craft of Creative Nonfiction (co-authored with Sondra Perl). Her essays have been widely anthologized and six of them have been Notables in Best American Essays.